We welcome authors and publishers to send promotional materials for display at ICTAM. The authors must either be present at the conference, or they or the publisher must give their written consent. Use of information on this website for the distribution of promotional material without the consent of IASTAM is expressly forbidden. 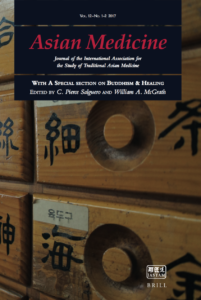 Asian Medicine: Journal of the International Association for the Study of Traditional Asian Medicine is a multidisciplinary journal aimed at researchers and practitioners of Asian Medicine. It makes available in one single publication academic essays that explore the historical, anthropological, sociological and philological dimensions of Asian medicine as well as practice reports from clinicians based in Asia and in Western countries, translations of relevant texts, and other types of articles. Current members of IASTAM receive free online access to all past and present issues of the journal via the Brill website (login required). Join now to start your free access! Non-members have free access to past issues from five years after the date of publication. Individual and institutional memberships, including electronic and/or print access, are available via Brill’s Asian Medicine web page.